The San Diego area has a lot to offer and we immediately start by making the list-o-things to do. During our research we see that Macy’s is giving away passes for a 50% discount off entry fees for most of the museums in the area so our first stop is the Chula Vista Mall to pick one up. This ends up saving us a bundle! 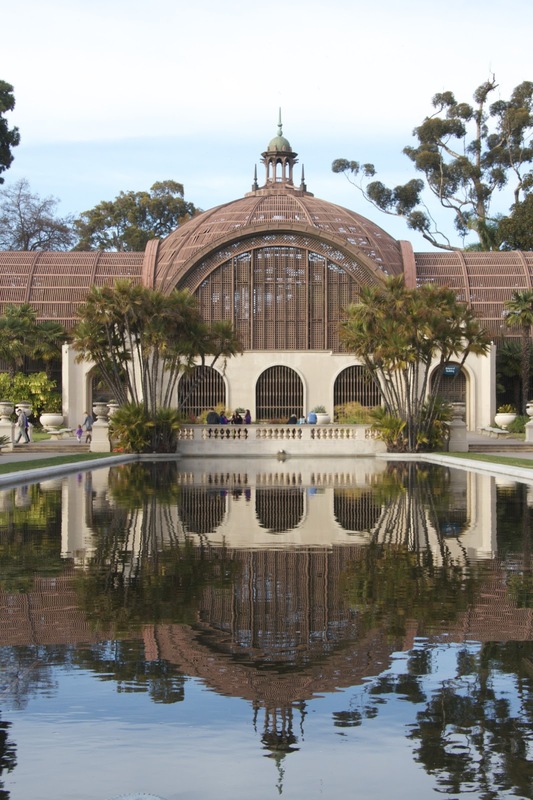 The 1,200-acre Balboa Park is the largest urban cultural park in the nation and the gem of San Diego. In addition to the world famous San Diego Zoo, the park is home to fifteen major museums, gardens, performing arts, hiking trails and restaurants. Here we take full advantage of out Macy’s 50 % off museum admissions discount card. The Automotive Museum has a special exhibit of low riders that sparkle and shine. They are fun to check out and tricky to photograph. They also display some beautifully restored vintage vehicles. 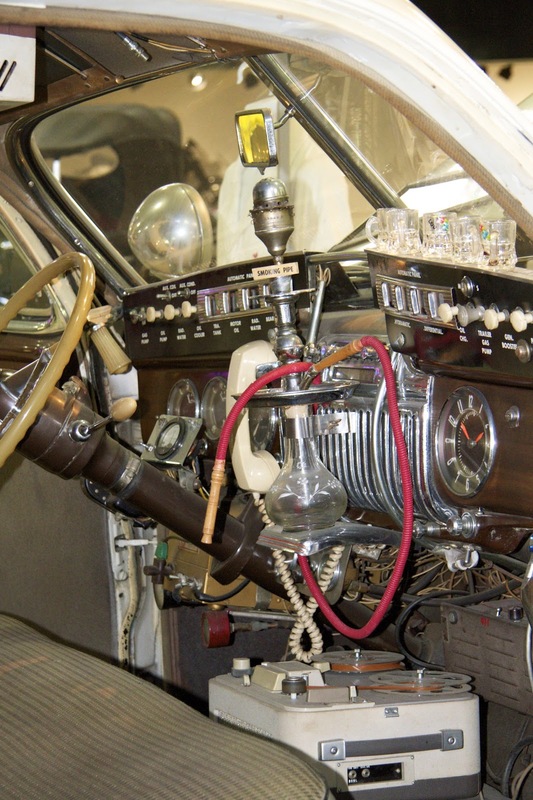 But the piece de resistance is “Louie Mattar’s Fabulous $75,000 Car.” Louie retrofitted this 1947 Cadillac with every convenience he could imagine (mobile phone, TV, stove, washing machine, shower, chemical toilet and more…) so he could travel NON-STOP, fueling, changing oil and tires on the go. 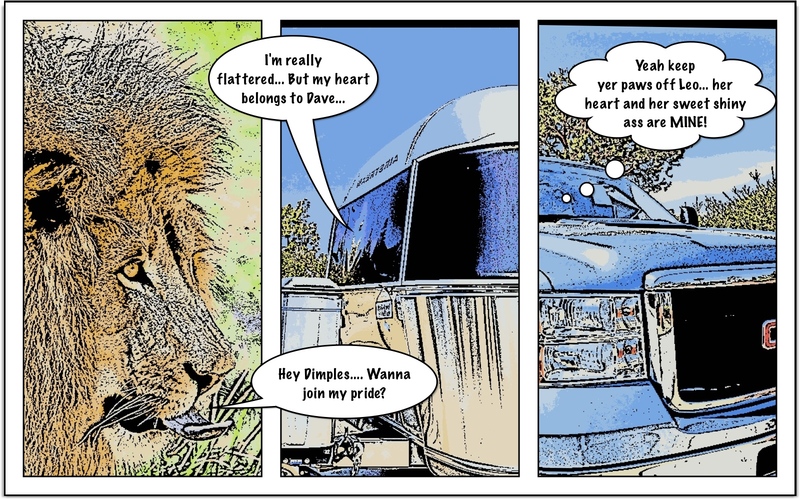 This vehicle may be the first motor home ever built and certainly the most unique. He and his crew traveled (without stopping for anything) 6,320 miles across the US in 1952 and 7,482 miles from Anchorage Alaska to Mexico City in 1954. 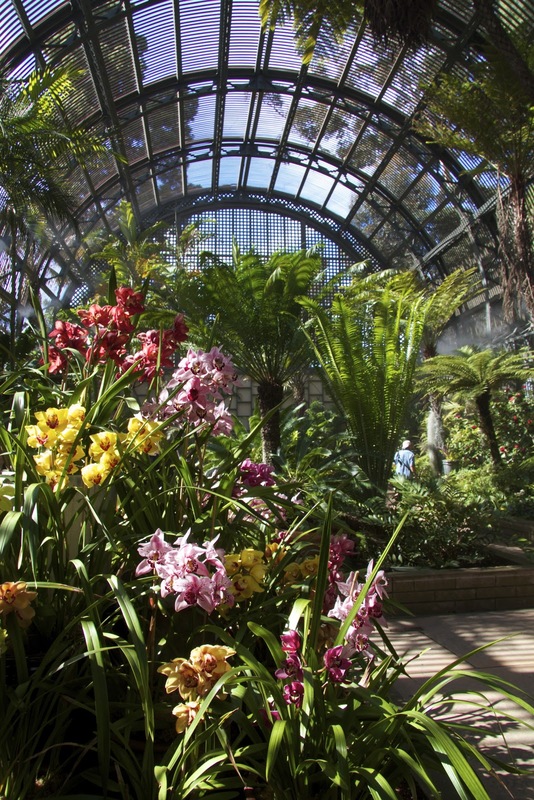 This month Orchids are the stars in the Botanical Building. Inside one of the largest lath structures in the world, thousands of blooms are nestled under palms and ferns and piled high in breathtaking chromatic displays. A light mist hangs in the air under the lath. Stunning! The Mingei International Museum is dedicated to art of the people (mingei) from all eras and cultures of the world. 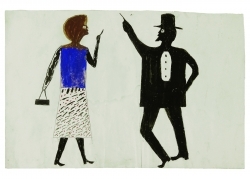 The exhibit “TRUE BLUE” a collection of turquoise, Lapis Lazuli, Indigo and cobalt draws us in, but we are blown away by the art of Bill Traylor, a self-taught artist from Montgomery, Alabama, who began drawing in his early eighties and produced over 1200 works during the last decade of his life. The works are done in graphite, colored pencil, poster paints and crayon on shirt cardboard, cast-off signs and wrappers. We are captivated with the emotion and storytelling of his works. There is also a wonderful exhibit of musical instruments. The Museum of Man offers an in-depth installation on human evolution. There are also Egyptian mummies, shrunken heads and lots of ancient artifacts. A special exhibit; Instruments of Torture is a chilling installation of implements cruelly engineered to inflict unbelievable pain and suffering. It forces us to explore how we, as humans, respond to events and take action. (Are people the real instruments of torture?) It examines how, in some situations, even those who swear that they would never torture another person, do exactly the opposite. 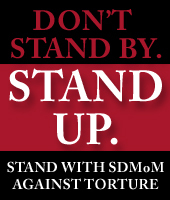 Ultimately, we are encouraged to contemplate our own human frailty, the conditions that lead to torture, and how we can be “upstanders”– people who stand up for others – in a world that has too many bystanders. On Sundays the International Cottages representing 32 nations are open and we explore international heritage and culture. These charming Spanish inspired haciendas display information about the various countries and ethnicities, and offer culinary samples of their national cuisines. After visiting the cottages we stop by the Speckles Organ Pavilion for a free concert of ginormous organ music. The music may not be our cup of tea but the mood is festive and light hearted. And then there is the ZOO! 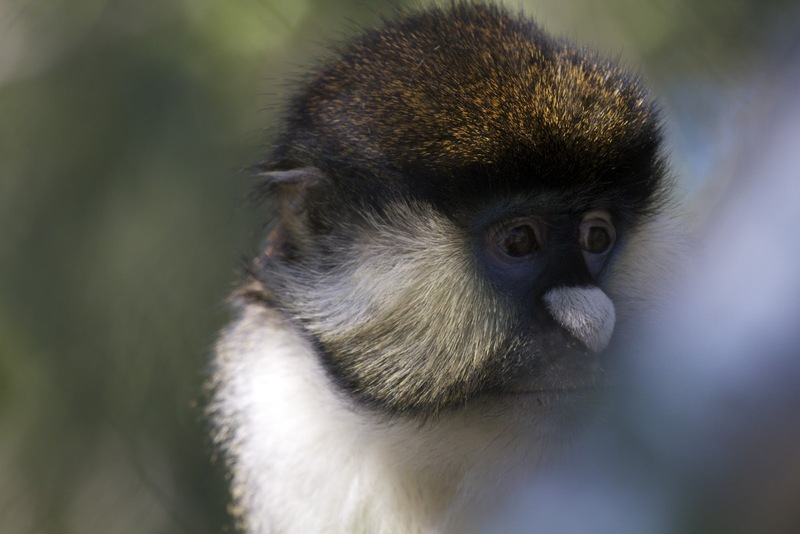 The 100-acre Zoo is home to over 3,700 rare and endangered animals. Their mission is to preserve and protect rare and endangered wildlife and habitats. After almost a century this pioneer of “cage less” exhibits is still one of the best in the nation. It is one of only four zoos in the country, which have giant pandas on display, and is the most successful in terms of panda reproduction. (Unfortunately when we visited one panda was face down asleep and all we could view was his derriere, the second panda was quarantined because he decided to remodel the habitat destroying some of the artificial trees – bad-bad panda!) But here’s a link to the Panda Cam so you can check them out here: PANDA CAM! 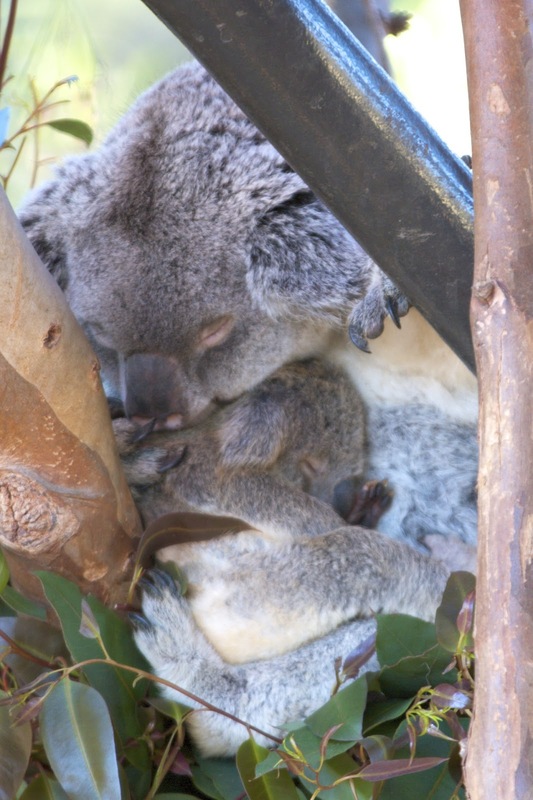 It is also home to more Koalas anywhere outside of Australia and they will soon be opening a new spectacular Koala habitat. The modern Elephant Odyssey features a display of extinct animals from Southern California's history, and their living descendants: elephants, lions, jaguars, sloths, camels, tapirs, pronghorn, California condors, and more! The Polar Bear Plunge offers the opportunity to watch these giant creatures from above and below the water. And for those at home there is also a Polar Cam! And Turtles... lost and lots of turtles... because they are the most endangered vertebrate on the planet! During this time we eat out a bit… but this post is already getting too long… so restaurant reviews will have to wait until the next post. The town of Palm Springs was and still is the playground of the mid twentieth century Hollywood celebrities. It oozes of the post-war glory days of high desert Xanadu. Many of the streets are named after stars of that era. Looking dated architecturally, seems a good thing… people looking dated… not so much… (I don’t think I have ever seen to many tucked, lifted, peeled and Botoxed humans, and frankly, the wide eyed surprised look on septuagenarians is kind of creepy.) Surrounding Palm Springs is a sprawl of gated communities surrounding golf courses and country clubs, and further out are the working class areas that house all of the service workers who tend to the elite. It is an interesting town to visit, and there is more to do than uncomfortable people watching. 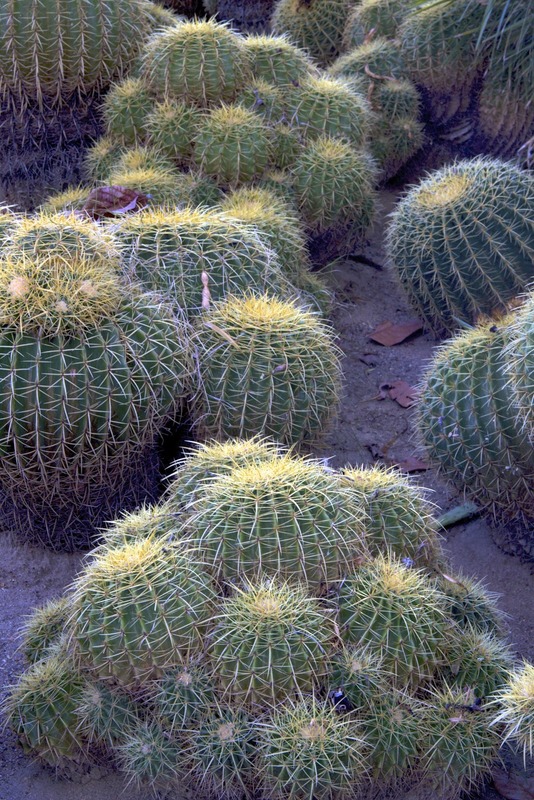 The Moorten Botanical Gardens is a family owned and operated establishment dedicated to cacti and desert vegetation including some rare and unusual species. This is obviously a labor of love that seems to be barely surviving on the $4 per person entrance fees charged and the few specimens for sale. Many of the signs are faded and not all of the plants are identified, but this is one of those “small on the edge spots” that is well worth the stop. 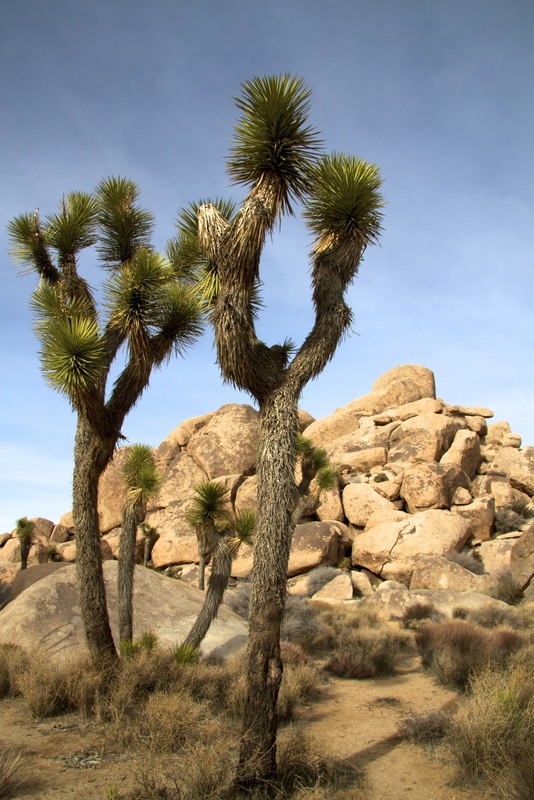 The Living Desert is a slick zoo and botanical garden dedicated to desert flora and fauna. (Thus the clever name LOL.) The cactus gardens are beautifully manicured and the animal displays fairly spacious (for a zoo.) 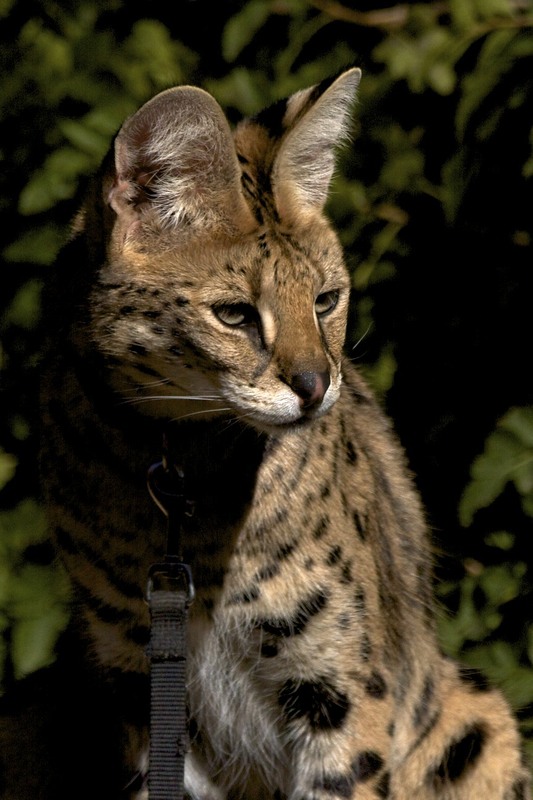 We see a plethora of exotic cats, zebras, giraffes, birds of prey, reptiles, rodents and more. The park backs up to the trails of Eisenhower peak and after seeing everything at the zoo, we do a short hike in the desert. We attend a matinee show of The Fabulous Palm Springs Follies with special guest star Lou Christie (of "Lightening Strikes" fame) at the historic Plaza Theatre. The show is a celebration of the spirit of early Palm Springs, in music, dance and comedy of the 40’s, 50’s, 60’s and 70’s. The entertainers do not have to stretch to fill their roles… for these talented folks are from those era’s. The youngest artists are in their 50’s and the oldest pushing 80. We purchased our tickets on-line the day of the show and are excited to score a couple of front row seats… note when ordering tickets and front row seats are available don’t be feel too lucky… the front row is expected to become part of the show… and Chris is the first victim. He holds his own with the MC Riff Markowitz. After the intermission I’m the target… and also hold my own… in fact after the show one of the patrons comes up to us and tells us that she thinks that Chris and I were the funniest part of the show… (She must not get out much LOL) Don’t worry, we are not stage struck and have no intention to pursue a late life career in show business. We stop by the Palm Springs Air Museum. 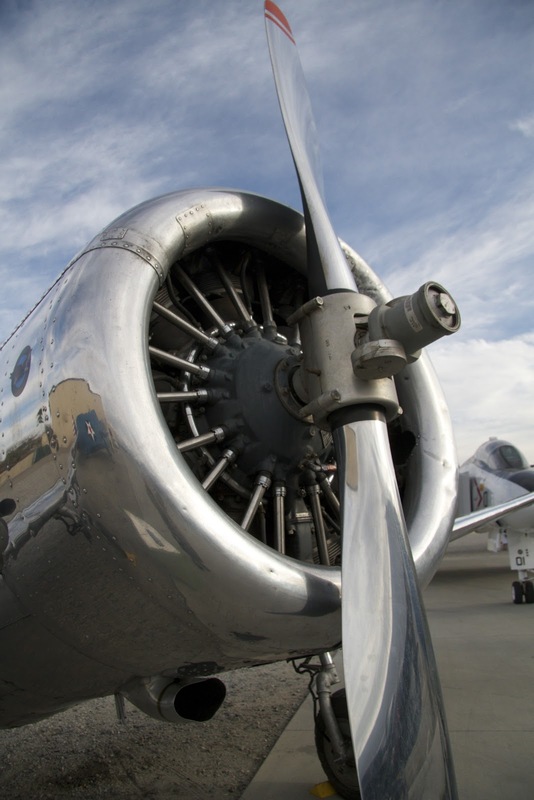 They have an outstanding collection of war birds including a B-17 Bomber that we are able to climb aboard. These planes look so much bigger and substantial in the movies. This is a flying shell with scant protection from the elements and a relatively small payload. 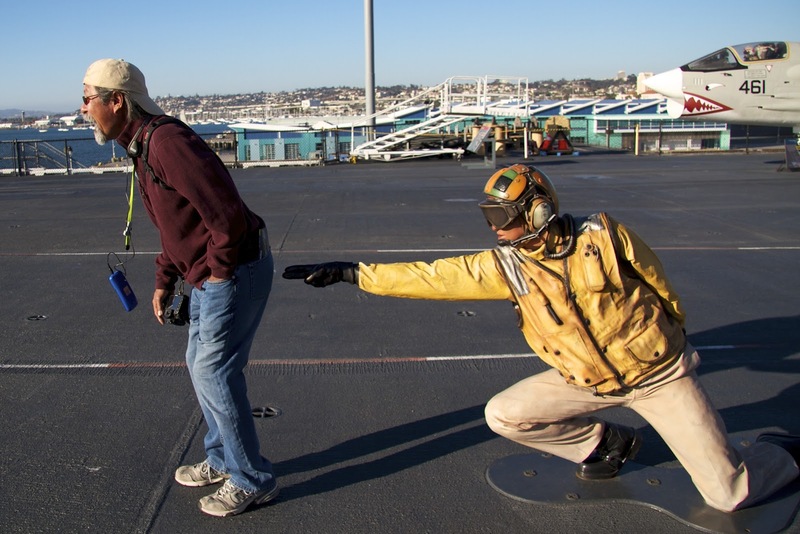 One of the docents was a ball turret gunner who completed 33 missions in the European theatre of WWII. (Impressive, since the life expectancy for a B-17 crew member was 14 missions.) He shares his personal experiences over the skies of Germany. We are impressed with the courage of these young men. 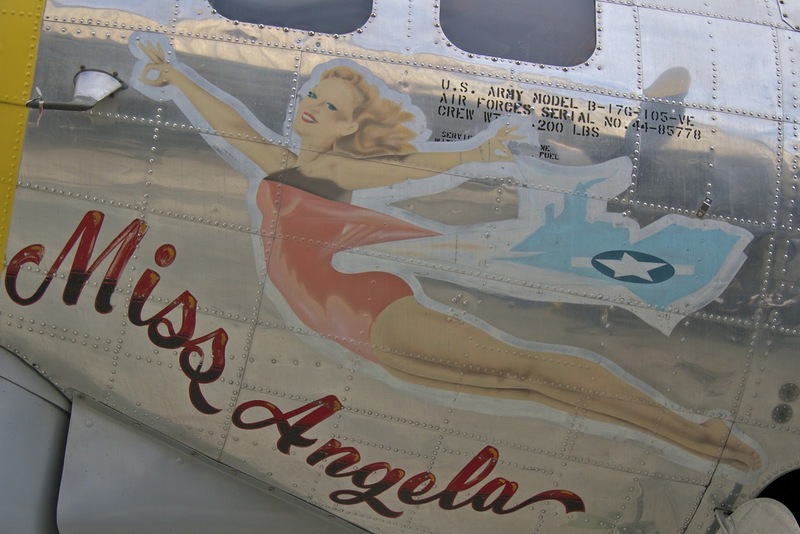 Most of the planes here are in excellent shape, although it seems that the nose art has been sanitized a bit. There is also an exhibit honoring Bob Hope and his work with the USO. Compared to the Air Museum we visited in Tillamook, this one is obviously better financed and much more comprehensive. We have a couple of rainy days and we head to the local Cineplex and catch Hansel and Gretel: Witch Hunters. This is a mindless popcorn flick and fairly entertaining. One foraging day is spent at the College of the Desert StreetFair and The Palm Springs Open Air Market where we pick up local produce. Another great source of fresh veggies and fruits is the Indio L&G Desert Store nearby. There are five Indian Casinos in the area and we visit two: Agua Caliente in Rancho Mirage and Fantasy Springs in Indio. Both are clean and fun. Since Fantasy Springs is a short drive from our park, we head over to watch the Super Bowl– well… Chris watched the game and I won and gave back on the slots. We enjoy a wonderful dinner at The Bistro after the game. (This takes the sting out of the 49er’s loss.) The menu is exciting wine list extensive and the prices quite reasonable. We start with Lobster and Scallop Rockefeller, which is simply out of this world. A Caesar Salad is shared and we both choose the Double Cut Colorado Lamb Chops smothered with a Khadrawi Date Curry Sauce accompanied with grill-roasted yams and haricot verts (BTW that’s French for green beans.) We also enjoy a bottle of Concannon Reserve Syrah. The portions are more than generous… so generous in fact, that we each can only finish one of the three chops on our plates. So we enjoy re-runs for a couple of days. In between adventures Chris makes some long time planned improvements to Dimples. 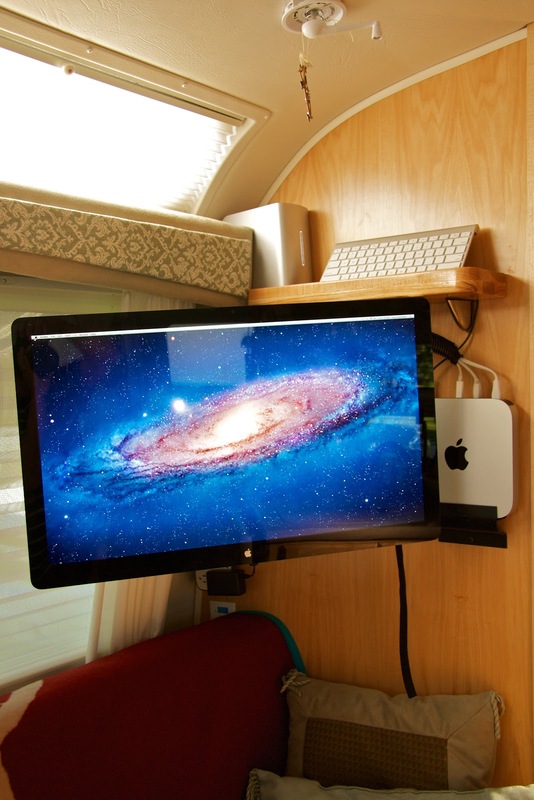 He makes and mounts a shelf for our “media center”, remodels the bedroom night stands to allow access from the top and blocks off the gaps under the bathroom sink that stuff seems to bounce into while traveling.